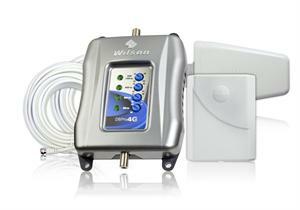 Wilson Electronics DB Pro™ 4G cellular signal booster improves coverage – including 4G, 3G and 2G data downloads for subscribers of all U.S. cellular carriers (except Clearwire). weboost DB Pro 4G signal amplifier works with all cellular devices, and supports multiple simultaneous connections across multiple carriers as well. Wilson DB Pro 4G amplifier 460103 will amplify wireless cell phone signal throughout an entire home or office, providing reliable voice and data coverage inside some of today’s energy efficient but cellular unfriendly buildings. Outside antenna choices include omni-directional or Yagi directional. The inside panel antenna, which rebroadcasts the amplified cell signal inside the building, is designed for optional flush mounting in the ceiling or wall. Components are connected using standard TV (RG-6) coax cable, which is often pre-wired in buildings. 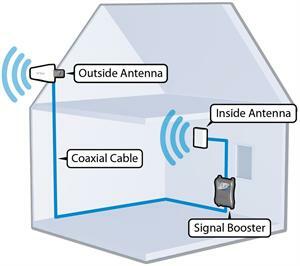 With weboost DB Pro 4G signal booster, you’ll see fewer dropped calls, faster downloads and a stronger, more reliable cellular signal indoors. You MUST operate this device with approv3ed antennas and cables as specified by the manufacturer. Antennas MUST be installed at least 20 cm (8 inches) from any person. You MUST cease operating this device immediately if requested by the FCC or a licensed wireless service provider.